Samsung today confirmed that the flagship Android experience that is the Galaxy S4 will arrive in the coming days. 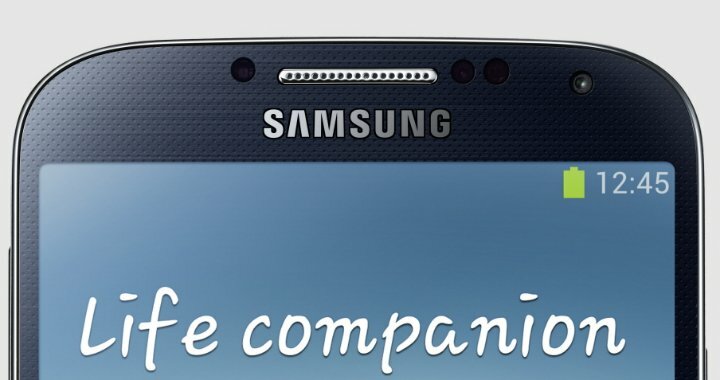 Officially touching down in April, there are seven providers expected to carry the Samsung smartphone. Among those lined up to offer the Galaxy S4 are Verizon, AT&T, Sprint, T-Mobile, U.S. Cellular, Cricket, and C Spire. Of course, you can also expect to pick up the phone at retailers such as Best Buy, Radio Shack, Target, Walmart, and others. DALLAS – April 17, 2013 – Building on the success and innovation of its predecessor, the Galaxy S® 4 provides a suite of industry-leading innovations that will change how consumers interact with a smartphone and delivers a greater level of security for regulated industries. The Galaxy S 4 uniquely makes advanced technologies and features easy to use by integrating them into the way individuals use their phones every day. The Galaxy S 4 is the first device to enable consumers to control the device with touch-less features including scrolling or turning a page, viewing documents within a file folder or a link on a web page. It enhances memorable moments with innovative camera features that captures progressive action and removes unwanted people from the photo. The Galaxy S 4 also enhances your TV watching experience with the new Samsung WatchON™ service that simplifies searching and recommends TV, movies and sports according to personal tastes. With WatchOn and the built in IR blaster, the Galaxy S 4 also functions as a remote control for home theater equipment. The Galaxy S 4 is optimized for powerful performance on the nation’s fastest networks and will be available on AT&T, Sprint, T-Mobile and Verizon Wireless as well as U.S. Cellular, Cricket and C Spire starting during April. Additionally, consumers can find the Galaxy S 4 at Best Buy and Best Buy Mobile, Costco, Radio Shack, Sam’s Club, Staples, Target and Wal-Mart. Exact pricing and retail availability will be announced by each of the carriers and retailers in the coming weeks. The Galaxy S 4 combines the simple and visual interface introduced with the Galaxy Camera with a 13-megapixel rear-facing camera to take professional looking photographs with a smartphone. The front-facing 2-megapixel camera on the Galaxy S 4 allows consumers to capture special moments in unique and new ways with the Dual Camera shooting mode. Dual Camera mode takes pictures with both the rear and front cameras simultaneously to enable the photographer to be in the photo as well. Compile photos with location and weather information with Story Album™ to create the most comprehensive and personalized memory book. Integration with Blurb’s photo book printing service allows consumers to easily print a physical book to keep or share. The Galaxy S 4 introduces a completely new way to interact with a smartphone – without a touch. A simple wave of the hand over the screen scrolls through a screen and changes a song; holding a finger over the screen allows one to preview content within the photo gallery, email and calendar; pause a video by looking away from the screen and scroll to the top or bottom of a page by looking up or down. The Galaxy S 4 is not only perfect for personal use, but it is enterprise ready as a SAFE™-designated device. The Galaxy S 4 is the first Samsung device to include Samsung’s KNOX solution, which provides comprehensive mobile security at the hardware level and enhanced personal privacy for individuals at the software level. All framework components come standard on the device, and full-feature activation by solution providers and distribution channels will be available at a later date. The Galaxy S 4 simultaneously delivers on IT executives’ need for industry-leading mobile security for companies with stringent security requirements. KNOX enables consumers to separate work via Samsung’s containerization approach. IT managers can now access and manage the passcode-protected work container without disturbing the content within an individual’s personal space on the device so consumer content, including photos, emails, music files and social network data remain intact on the device when an employee separates from a company. With the Galaxy S 4, there are a number of features to simplify the experience for first-time smartphone owners, those interested in switching from another operating system and long-time Samsung consumers. The Galaxy S 4 has a streamlined start-up wizard so consumers can begin using the device faster and learn about its unique features from the start. Easy Mode, which was first introduced on the Galaxy S III, has been enhanced to smooth the transition for first-time smartphone owners by simplifying the home screen layout, camera, calendar, messaging and the internet browser to make the settings menu easy to navigate. Once a user is more comfortable with their Galaxy S 4, they can easily switch back to the standard home screen interface. With the launch of the Galaxy S 4, Samsung is also introducing Samsung Smart Switch™, a PC application that lets new owners transfer contacts, messages, photos, music, calendar notifications and more from another phone to the Galaxy S 4. Smart Switch can identify favorite applications and recommend the same or similar applications within Google Play™. The Galaxy S 4 greatly improves upon the popular notification shade, which provides quick control of new innovative features, and the functionality most often accessed and changed by consumers. The expanded notification shade shows 19 settings so consumers can quickly and easily toggle them on and off as needed. The sophisticated Galaxy S 4 is designed with a full-HD Super AMOLED™ (1920 X 1080) display with 441ppi for brilliant, stunning graphics on the device’s 5-inch screen. The slimmer, sleeker smartphone weighs 4.6 ounces, is 7.9 millimeters thin and has a minimized bezel to maximize the viewing experience. The Galaxy S 4 includes Android™ 4.2.2 (Jelly Bean) with TouchWiz® enhancements, a 1.9 GHz quad core CPU and 2GB of internal RAM. The Galaxy S 4 is also uses Gorilla Glass® 3.0 – the most advanced, fortified glass for its stunning 5-inch display, making it stronger and more resistant to scratches and cracks than ever before. The Galaxy S 4, available at select carriers in Black Mist and White Frost, is powered by a removable 2,600 mAh battery for extended use on a single charge. Users can store large libraries of photos, music and videos on the Galaxy S 4 with expandable memory of up to 64 GB to complement the standard 16GB or 32GB of onboard storage. Protect the Galaxy S 4 with the S View Flip Cover, a specially designed flip cover that has a clear window to read a text message, answer or reject a call, and view the battery status. Sold separately, the S View Flip Cover comes in Black Mist and White Frost to add style, while protecting the device and providing privacy, and is sold separately. For more information on the Galaxy S 4 and accessories, please visit www.samsung.com/us/galaxys4 orwww.samsungmobileuspress.com.